Based on the work of Keith Mallet, this contemporary tapestry is an abstract design with motifs from elements of nature. In this piece "Nature's Elements" we see the maple and other leaves showcased in a modern design which features blocks of color and motifs themselves which is a trademark of many of his works. The color palette is cohesive yet restrained. The greens and yellows of the leaves and background in the upper section provides relief to the deeper and more somber tones elsewhere. The leaves of the branches are always lit in one section to provide a sense of light permeating through various sections of the composition in varying depths inside the image. 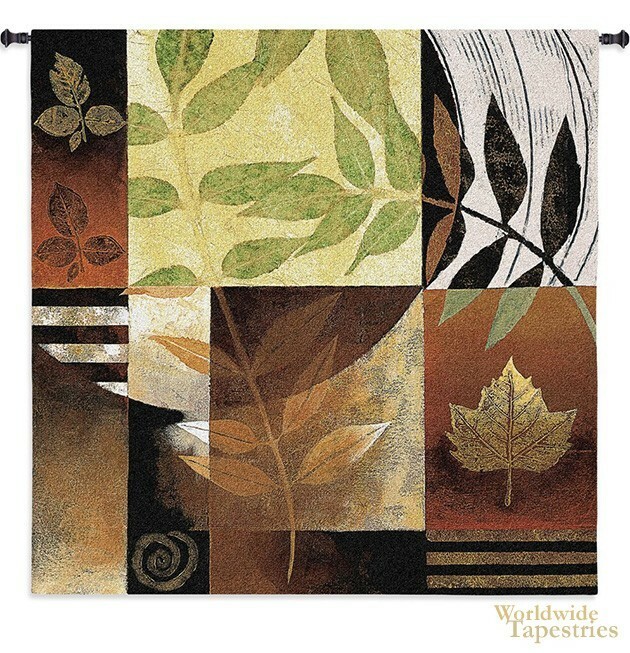 This contemporary wall hanging "Nature's Elements" is backed with a lining and has a tunnel for easy hanging. Note: tapestry rod and tassels, where pictured, are purchased separately.